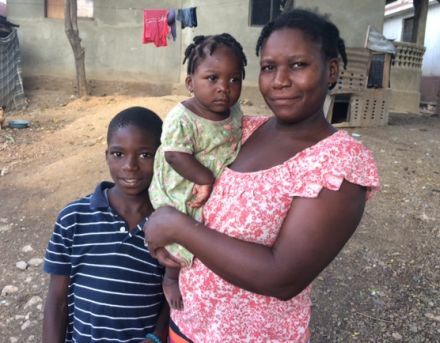 Reading, Pennsylvania’s Jennifer Little joined West Lawn United Methodist Church’s service trip to Pigñon, Haiti, to help a family build a simple, decent home through The Fuller Center for Housing’s Global Builders program. It was an opportunity to do some soul-bolstering manual labor and help people in a much different way than her usual job as a registered nurse with the Wilson School District. Before the week of work was over, however, she would put her nursing skills to use — to the tremendous appreciation of a mother whose child had been suffering for several weeks. On the second-to-last day of West Lawn UMC’s build, Little learned that one of the homeowner partner’s children had been enduring extreme pain in his ear. When she examined the child, she saw that his ear was swollen and crusted on the outside. West Lawn’s team leader offered to pay for the medical care, but they needed to get the child to the nearest hospital. And that would require a trip by motorcycle — hardly Little’s preferred mode of transportation. 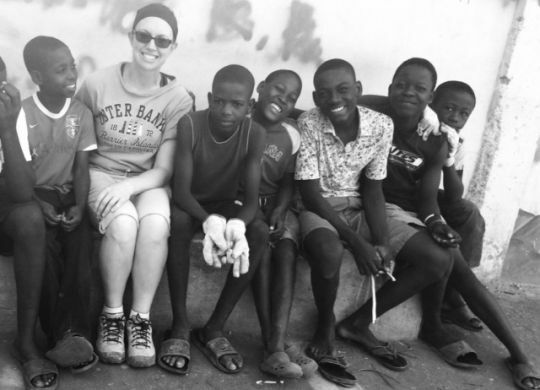 The family Jennifer Little was able to help in Pigñon, Haiti. The boy was diagnosed with a severe ear infection, and the West Lawn team purchased Ibuprofen and antibiotics for treatment. When Little returned to the job site, she showed the mother how to correctly administer the medicine. “As we were leaving that day, she gave me a huge hug and told me that I was ‘a gift from God,'” Little recalled. “I’ve never been told that before. It was just so cool. The experience has made her not only want to serve abroad again but also has bolstered her faith and made her appreciate home even more. “This experience has had a life-long impact on me, something that I will never forget,”. she said. “It’s just kind of changed everything for me. I came home with a whole new appreciation for everything that we have and being able to provide a life and home for my kids. You just don’t take anything for granted when you come back. Proud of you Jen !!! That’s an awesome story ! !